Preheat oven to 350 degrees F. Cut one-fourth off the top of bread lengthwise and set aside. Using your fingers, hollow out bread bottom to 1/2-in. from the crust on bottom and sides. Spread half of Pesto Sauce evenly inside the bread bottom. Layer 1/2 of the salami, mortadella, capicola and provolone cheese, and spread Bruschetta evenly on top. Layer with the remaining 1/2 of salami, mortadella, capicola and provolone cheese. Arrange onion and pepper rings on top and sprinkle with Parmesan cheese. Spread the remaining Pesto Sauce on cut side of reserved bread top and place on sandwich. Lightly press down on the bread top and wrap tightly in aluminum foil. Place on baking sheet and place another baking sheet on top of sandwich for weight. Bake for 25 to 30 minutes, or until heated through. Cut into 8 slices and serve warm. 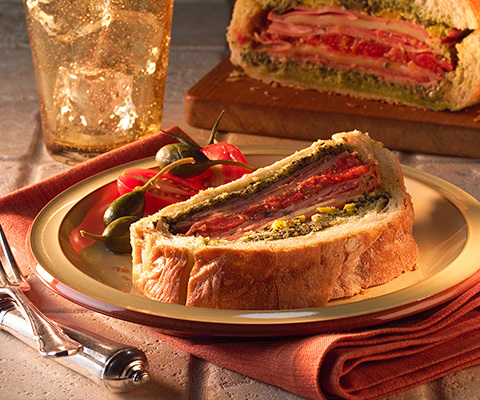 For a spicier version, use Genoa salami, hot soppressata and hot capicola with hot pepper cheese and hot pepper rings.TIP: If desired, substitute Classico Traditional Basil Pesto Sauce & Spread with Classico Sun-Dried Tomato Pesto Sauce & Spread.